Russell Kane Smoke Screens & Castles DVD Review If you're a fan of Russell Kane, you might want to check it out but for those that want to relate to their comedy, you might want to give this a miss! Okay... sometimes comedy from another country, even if it's Merry old England doesn't translate too well and unfortunately Russell Kane Smoke Screens & Castles falls into this category. 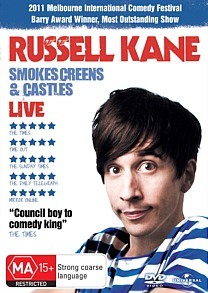 This 2010 stand-up show by Russell Kane paints himself as a council boy gone comedy king. Initially the gags are quite amusing, however as his stand-up routine progresses, things become a little cloudy and many of the jokes are either lost in translation or are just down right embarrassing. Although I must admit that I did find his intro a little amusing, especially how he informs the viewers that his neighbours thought his family became snobs when his father purchased their council house. These jokes do border on the Australian "Housos" phenomenon. Then he starts to heckle a boy in the audience which was also amusing but from there, his stand-up routine becomes a mess of jokes that work and fail. It's unfortunately because I've seen some of Kane's other material which was truly entertaining. If you're a fan of Russell Kane, you might want to check it out but for those that want to relate to their comedy, you might want to give this a miss!